With Fast and Furious culture gaining popularity, you will find many young people getting involved in such acts which involve cars and racing and making donuts on the roads. Where these acts are dangerous, other people get affect by it to some extent as well. Not to mention the burning of tires and destruction of road and other related things. 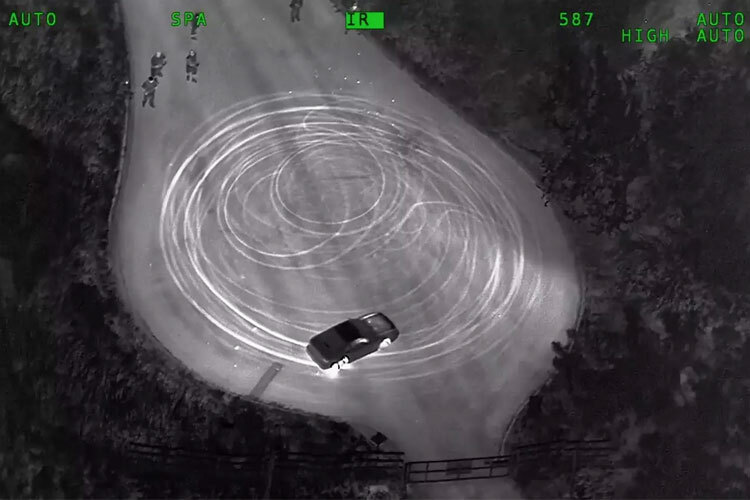 In last week, California Highway Patrol posted an aerial video of their operation in which they used aerial help as in helicopters and 5 patrol cars to catch a 21-year-old kid who was busy making donuts while being in the safe area. According to the video, you can see that a small group of people was standing, perhaps watching the kid doing the donuts on the road. After a few minutes, as the kid drove to the end of the road, five patrol cars surrounded it and arrested while the helicopter crew continued with observation. **Sideshow Conviction** On July 21st we posted about a sideshow that one of our airplane crews located at the end of Lynch Road in Solano County. Last Tuesday, our crew was in court when the suspect was convicted for participating in a speed contest (23109 (c) vc). The 21 year old Elk Grove man was given a 30-day drivers license suspension along with a $850 fine.Sideshows are illegal…those who participate in them will be arrested with steep fines and suspensions of their drivers license. Now there has been an argument of some sort that is it really wise to use such resources to catch a kid while he was doing some stunts in a relatively remote and safe area. I don’t think so. And if you see carefully on the Google Satellite then you will see that that spot has been used for such acts before as well. While there is no doubt that such acts are dangerous and they can cause you a serious injury, the place was very safe as no interruption of traffic was happening; also, the closest house was miles away. Another interesting note to be mentioned here is that the driver was convicted last week with the punishment of 30 days of driver’s license suspension $850 fine while the arrest happened in July last year.